Radio wave propagation may be a form of pollution but it could be a source of free, ubiquitous energy. A free, green way to harvest energy from the radio waves all around us has been developed by a research team from Georgia Tech School of Electrical and Computer Engineering. On a waveband basis, the available power is low, but there is a lot of it about with mobile phones, TV transmissions, satellite communications systems and Wi-Fi, to mention but a few, the air is full of radio waves. By scavenging this ambient energy, its AC pulses can be converted into DC power for storage in super capacitors or batteries. HARVESTING ENERGY FROM RADIO TRAFFIC. For several years, the Georgia tech team has been working on very low-cost transducers that can tap into these transmissions and could result in a free, constant flow of electricity to power-up improved devices such as RFID tags, environmental monitors and medical sensors. 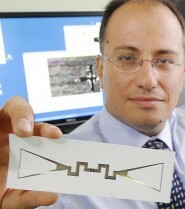 It could even provide the power to add security to a new generation of RFID tags. The antennas will be low-cost to produce, he said, and the research units are printed using ordinary ink-jet machines using a nanoparticle “ink”. The substrate is either paper or a flexible polymer. The ink is described as “a unique in-house recipe” containing silver nanoparticles and/or other nanoparticles in an emulsion. This not only allows RF components and circuits to be printed but also opens up the possibilities of novel sensing devices based on carbon nanotubes and other nanomaterials. Many different frequency ranges are used by communications devices. The team’s scavenging devices can capitalise on frequencies from FM radio to radar, a range spanning 100MHz to 15GHz) or higher. The antennas can be tuned for use in specific environments, such as an airport where radar and fixed comms channels are major sources of free energy. When the research group began ink-jet printing antennas in 2006, the paper-based circuits only functioned at frequencies of 100 or 200MHz, recalled Rushi Vyas (pictured with Tentzeris), a graduate student who is working on the project. Experiments using the transmission bands from a TV station half a kilometre away from the test site have yielded hundreds of microwatts of power. This was sufficient to run a temperature sensor but multi-band systems are expected to generate a milliwatt or more. The group is planning another demonstration where a microprocessor-based microcontroller would be activated simply by holding it in the air. Super-capacitors may be used to to power devices requiring above 50 milliwatts in a cycled operation. When power builds up to a preset level in the capacitor, it will be used to power the device and then will recharge. The scavenging device could piggy-back solar energy panels so that, when the system stops generating power at sundown, the wireless energy could be used overnight to increase the battery charge or to prevent power leakage. The devices would also be useful in remote areas where an outage of a traditional power source could be flagged by sending a distress signal from an antenna-powered unit. The possibilities are even more interesting in the world of RFID tags. Having a handy power supply attached would allow more features to be included in the tag. However, combining RFID tagging with sensors could offer even better returns. Transportation of food is expensive and can be hit by strikes, vehicle or refrigeration breakdowns, traffic or timetable delays, and many other problems. Using radio-powered RFID tags linked to similarly-powered sensors would enable real time monitoring of any degradation in the cargo. This possibility is not new but current systems rely on monitors using environmentally-damaging and more-costly batteries that have to be replaced from time to time. Tentzeris said that self-powered, wireless, paper-based sensors will soon be widely available at very low cost but did not express a specific timeframe.